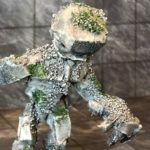 Some time back I was watching Jeremy on Black Magic Craft [Youtube] and in one episode he built his own epic scale Earth Elemental or Rock Golem. If that doesn’t mean much, think Rock Monster or go watch the video. His was a very large scale build and I don’t have that much room to either store something that size or probably much opportunity to use something that big, so I decided to build something more roughly sized to the games we play where it was, maybe, twice as big as a typical player. 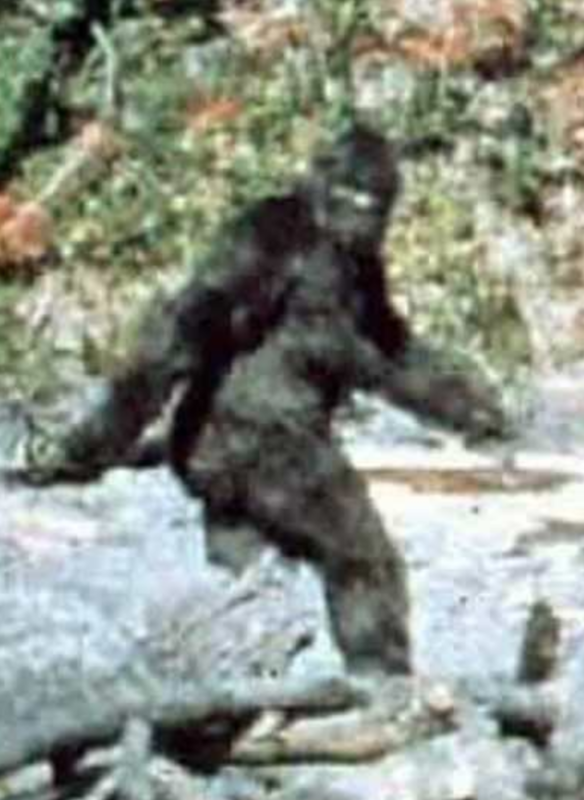 Maybe 8′-10′ scale feet tall. 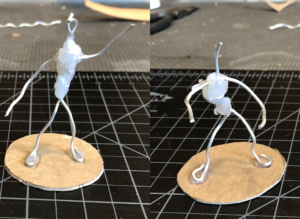 For my version, I thought I might benefit from adding a bit more skeletal support, so I wanted to build an armature out of some aluminum wire I had, so I twisted something up, applied copious amounts of hot glue and got the basic armature and did a big of basic positioning of the torso, arms and legs. Once I was generally happy with the results, I glued these go some chip board to secure it and allow me to build on it. 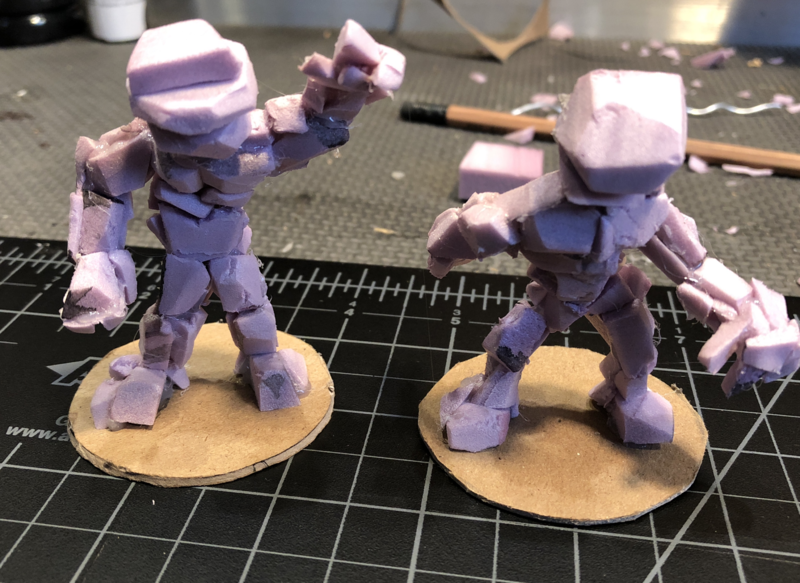 After I had that, I decided to take a very loose and non-judgemental approach to how I built up the creatures, starting with the feet, building out the front of the legs then the back, moving up to the torso and then down the arms and eventually up to the neck and head. You’ll note that I built a couple at the same time. This was in hopes I’d end up with at least one I was happy with and if I ended up with two, bonus! 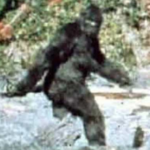 As it turned out, I really liked the one on the right in the pictures because I thought it looked a bit like the Bigfoot pose in the Patterson-Gimlin film. The other guy, well, I wasn’t quite as happy. Despite my best intentions, he ended looking, for lack of a better word, “muppet-y”. Like a stone, cold Grover. Sigh. I even cut off the first version of his head and tried again and he still looked Grover-y in version 2, so I decided that that was how he was supposed to look. Sigh. Next, I added some sand and small rocks to the base because, well, Earth Elementals and I hoped it’d add some visual interest and make them a bit less smooth. 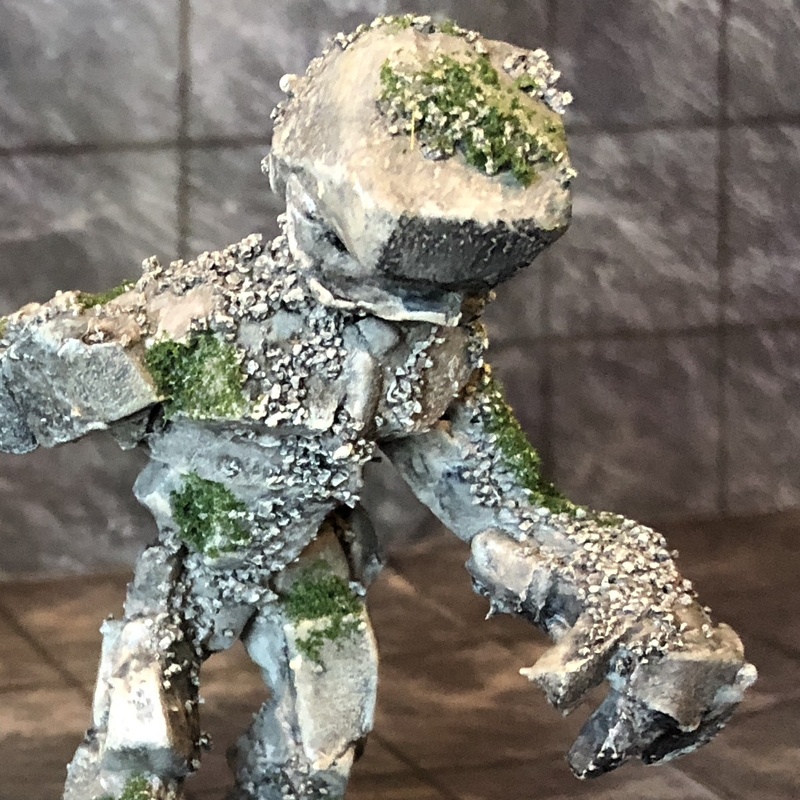 After that dried, I did a base coat of black ModPodge to stiffen and seal, followed by a medium gray and then some dry brushing with lighter tones. I used a wash to tone that down and then hit some of the sand and highlights again with a very light and bright dry brush to make it pop a bit more. Then I added some green moss because that felt about right. Finally, I hit it with some satin polyurethane to seal and I was done! 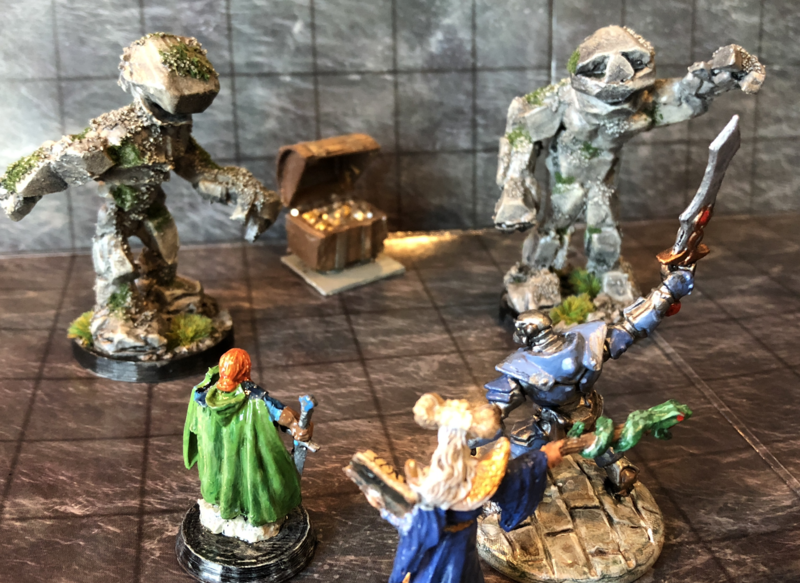 Last, but not least, some class pics with some foolish adventurers for scale. 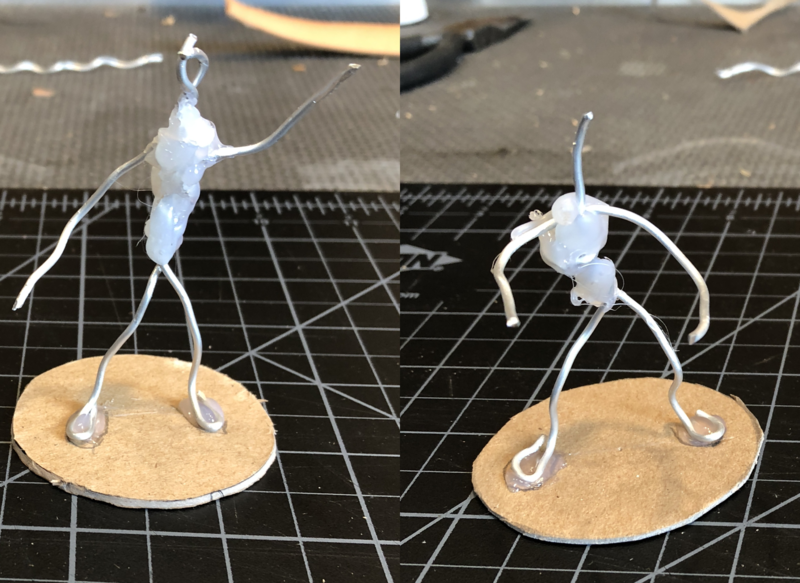 I was pretty happy with the results for what was a pretty quick build. 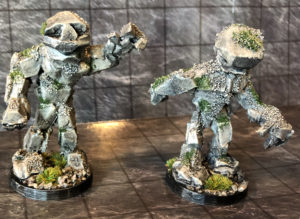 Stone Grover aside.